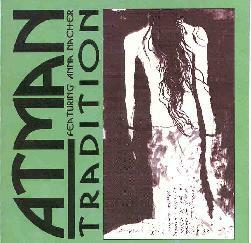 From Poland, Atman plays acoustic psychedelic folk music that includes traces of rock and jazz. They use a wide range of instrumentation that I couldn't begin to list, but will quote the following from their web page: "During their concerts the musicians of Atman use dozens of exclusively acoustic instruments originating mainly in Asia, Europe and Australia. Some of them are completely unique - ancient Polish dulcimer, singing bowls and other liturgic Tibetan instruments, Australian didjeridu and Slovakian pastoral fujara - while others are built following the models of "extinct" instruments and created in workshops headed by members of the group". The band has apparently been together for nearly 20 years releasing tapes on their own Fly Records label. On "Tradition" the band is a six piece consisting of Anna Nacher, Marek Styczynski, Marek Leszczynski, Piotr Koleck, Tomasz Radziuk, and Tomasz Gulinski. The music is subtly complex and utilizes the band's array of instrumentation to create an ethnic psychedelia that will make you want to dance in the woods and call up the spirits of the forest. Various members have apparently traveled in Tibet and India and the influences of these countries are apparent in the music. They even do a cover of Jimi Hendrix's "Third Stone From The Sun" making it fit completely with the style of the other songs on this disc. Anna Nacher's vocals are a gorgeous chanting style. She often sings in what I'm sure is her native Polish though words are unnecessary for enjoying the music. Many songs include multiple layers of stringed instruments all with their own distinct identity making this a trippy journey across many cultures and continents. For more information visit the Drunken Fish Records web site.